I am pleased that the first U.S. cruise ship to make a voyage to Cuba in almost 40 years arrived in Havana, Cuba, yesterday morning carrying 700 passengers, including Cuban Americans on board. This is an exciting development since my historic trip with President Barack Obama who led a small bipartisan delegation to the Island Nation. The last sitting U.S. President to visit Cuba before the Cold War was Calvin Coolidge in 1928, two years before I was born. I would have never imagined in 1995 when Fidel Castro visited Harlem that I would be traveling to Cuba with my President to meet with his brother, President Raul Castro. We reaffirmed our efforts to cement our new ties and push for ending the embargo. I am confident that both of our nations and citizens will benefit through the exchange of people, goods, and ideas. I was fortunate to witness the excitement on the streets of Havana in December 2014, when President Obama first announced his plan to chart a new course in our diplomatic relationship with Cuba. As the sponsor of the Promoting American Agricultural and Medical Exports to Cuba Act, I had originally traveled to Havana with few other congressmen to explore how the United States could gain access to a miraculous drug that could cure ulcers. Because I had stayed an extra few days, I was able to report through multiple television interviews from Havana to the American audience how Cubans embraced the news of rekindling our ties. I have long recognized that the embargo has proved futile. I first introduced my Free Trade with Cuba Act in 1993, and since have repeatedly introduced bills and pushed for policies that would end it. Through numerous discussions with people, businesses, and organizations, and it is abundantly clear to me that economic relaxation affords many American firms to increase their services to the people in Cuba, which includes the hospitality industry, agriculture industries, and any number of other American businesses and it creates a climate for successful American investments. For example, we know that Cuba imports about seventy to eighty percent of its food supply, representing a market estimated to exceed over $1 billion per year for U.S. agriculture exports. Through 2008, U.S. rice exporters shipped over 12,000 metric tons with an estimated farm gate value to our economy of $7 million. Since 2008, due our trade restrictions and corresponding inability to provide competitive credit terms, we lost this Cuba market to Vietnam, Brazil, and others. If we were to lift the embargo, the global advocate for the U.S. rice industry, the USA Rice Federation estimates within two years, we could regain 20 to 30 percent of the Cuban import market, worth nearly $70 million and in five years 50 percent of the market, about 300,000 metric tons worth about $153 million to the US economy. Not to mention the increased jobs in the rice growing, milling, and shipping industries associated with the increased exports. Furthermore, allowing trade with Cuba will not only generate revenue for our economy, but will also enable us to exchange American culture and ideals that can help foster democratic principles in Cuba. 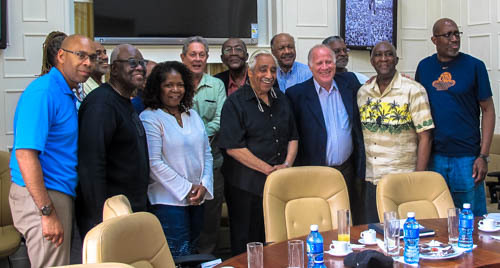 After the President left, I remained in Havana with a delegation from the Greater Harlem Chamber of Commerce consisting of 21 key professionals in the fields of art, culture, education, engineering, health, law and business. Together we met with senior ministers of the Cuban government to finalize the first annual 'Havana in Harlem Cultural Festival' which will be launched in August 2016 in our own backyard in Harlem. The Festival will then take place annually during the summer in Harlem and during the winter in Havana. It will focus on the Harlem-Havana Afro-Cuban exchange of performing arts, fine arts, and cultural seminars. With New York City's shared African and Cuban roots, the annual festival is expected to initially attract thousands of visitors from around the world annually to Harlem and to Havana and continue to grow. Through such people-to-people exchanges and culture, we can promote peace, democracy and human rights. The answer to when the U.S. Congress will lift the embargo lies in the hands of American voters. Over 70 percent of us support normalizing relations with Cuba. Both the Cuban and American people acknowledge that the embargo has been extremely unsuccessful. I believe we can end it soon and bring about real change in our relationship. I will keep fighting to create the right conditions for when that time comes when our two nations can work collectively towards peace and prosperity.